Petition Queen : Votes for Life. 3.7 million British abroad want their votes back! 700,000+ British in EU had their Brexit Referendum rights to vote stolen by Parliament. 2019-03-14: Frozen Closed & printed, added to paper signature sheets, added to covering letter, & enveloped. 2019-03-15: posted (with tracking code Ask Julian ) to the Queen. Note all the On Request had real contact info on the paper copy posted to the Queen. Contact info removed from the web to hinder spammers & identity thieves. Petition to the Queen, (references British in Munich), space For a few signatures at bottom, positioned for a posting in a window envelope. Plain Text to email your friends. Shorter Petition, (omits mention of Munich). FROZEN Sign the original version including the British in Munich example. (If you want a 2nd signing list for the alternate shorter version omitting Munich example, let us know). FROZEN Please Sign especially if you'r living inside Britain, as you are still counted by the parliament that abuses British abroad. Print & Post your own. See Brexit page inc. references to Hansard on votes denied etc. Maybe some British abroad previously tolerated that the British Parliament had stolen their General Election votes for years, as a new election comes every few years, & one would come up a few years after any return to the UK. But when Britain conducted an ill informed low margin Brexit referendum after stealing votes of British abroad, & then pursued a hard chaotic Brexit, that would impact & them not just for a general election term, but for the rest of their lives, British abroad became increasingly angry. British Parliament stole 3,700,000 votes from British citizens globally, inc 700,000+ in EU, before the Brexit referendum, from All those abroad over 15 years ie the British in the EU who knew most about the EU ! Stupidly dis-enfranchising the most knowledgeable electorate. All European countries except Britain & Eire let citizens vote abroad, + USA & Turkey & many other countries too. : Britain is _less_ democratic than most civilised countries. When [If?] Britain forces Brexit through & itself out of the EU, British abroad will also loose their last representation: MEPs (Members Of the European Parliament) No one in Britain or EU will then represent them. Britain will have totally stolen _All_ representation from British Abroad - & Britain still pretends it's a democracy ! "UK Govt. lied it's "democratic" in Article 50 letter to EU paragraph 3." If this is your first use of a Mailman server, if you want you could first have a try with the test list but it's not necessary, most just FROZEN sign straight up. It would be inappropriate for someone to FROZEN sign who is Not a British citizen or UK of GB & NI resident (or perhaps of one of her other realms). ( Sundry Eire & commonwealth citizens if resident in UK can also vote in UK).) 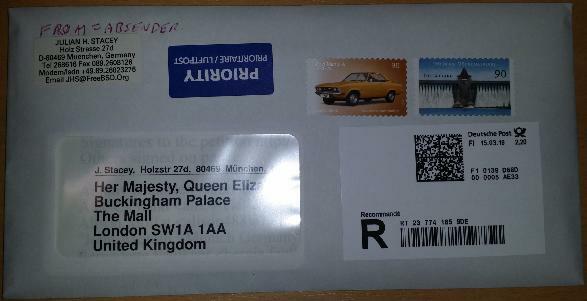 Guideline: This is addressed to the Queen: What is your country / nationality ? Is she Your monarch ? does she represent You ? You do NOT need to be abroad to FROZEN sign or post this. British in the UK are encouraged to FROZEN sign too, & they also have their own MPs they can contact (just as "Votes For Women" campaign needed men's support a century ago, so today British Abroad need support of British in the UK. Please use your normal human name, eg Julian H. Stacey Not a weird disguised email alias address. Let the Queen recognise we're normal people with a valid case, not weirdos disguising themselves. The server will test your email address to make sure it works. We may discard obvious non human names. Please only FROZEN sign once. Please suggest to others to FROZEN sign too. Please conform to the wording "I am a British citizen or UK resident" (on parliament petition "Hold a referendum on the final Brexit deal" & "Give all British citizens living abroad the right to vote and dedicated MPs"
After your name, please append a colon (':') then town & country, or UK constituency (just like parliament petitions). Petition FROZEN votes-sign is in form of a silent mail list, as that mechanism is already working well here, plus it allows verification of email addresses, before it's forwarded to the Queen's staff who may want to do spot checks. It also allows us if necessary to ask you to transfer to FROZEN sign another replacement petition site, or to ask you to approve a possible change of wording, etc. Most unusual for normal petitions, this server also allows you to update your address, or rescind your assent if you change your mind; But only while your old original FROZEN signed email address still works! If you will change your email address, remove yourself from the petition before your old address ceases to work. Then FROZEN sign up with new address. In case you fumble that, please use exactly the same human name as before, to help spot duplicates, thanks. Berklix does not have a feature displaying names of last people to FROZEN sign, that costs effort, usually paid by commercial servers carrying adverts or selling lists, or goverment petition sites funded by taxes. Berklix is non commercial, no adverts, & no lists sold etc. Berklix doesn't have the UK parliament's (& others) annoying limited software that only allows UK postcodes. This petition is Not crippled by a timeout race to reach critical mass, unlike eg UK Parliament's official petition web site where all get thrown away after 6 months (so petitions with fat publicity budgets or viral social media sites are more likely to succeed there). Once critical mass is reached here, you may be mailed, & asked to FROZEN sign an official petition, perhaps on another site, possibly another in coalition of British Abroad web sites, or even the parliament's petitions web site (though it's debatable if one would trust the parliament that stole 3.7 million votes, & runs a referendum web site that is crippled to obstruct use & statistics from outside the UK. Other than above, there's no plans to use your email addresses, & certainly not to sell list. Please print & post or edit your own, link, create similar content, or forward to friends or groups etc. Could be in form of individual letters letter writing campaigns, or petitions. You're welcome to contact author to exchange & maintain links etc. Though the Queen may be unlikely to see individual letters, hopefully her staff will pass on the gist. More chance the more people send copies or similar. "The Queen cannot interfere with what the government decides, much as she might or probably would like to." Whether she will help, we won't know until we ask, & publicise to increase requests. The Monarch's non participation in politics is a recent convention that may change, especially in a crisis. Constitution of the United Kingdom - Royal prerogative - Domestic powers - The power to dismiss and appoint a Prime Minister etc - some published by government in 2004. The Government's purchased Irish alliance may unravel. Brexit or other issues may cause schism[s] in parties. The Monarch chooses who to invite to try to create a government coalition. Monarch doesn't have to invite leader of largest minority party. Monarchs have also invited others to see if capable of forming a working government even without a majority. The Queen could certainly have a strong word with weak PM May, who instigated dissolution of parliament & called a snap election, lost her majority, & depends on 10 N. Irish DUP votes at "extra £(GBP) 1bn over the next two years". A monarch can stop, or delay granting Royal Assent to bills passed by parliament. There's particular cause for an undemocratic rump Parliament not representing 3.7 million British. A Monarch could create more Lords, the latter has been done several times before in times of constitutional crisis. London, The mega economy of the UK doesn't want Brexit: Job pull outs already, more to come. Southern England property market under pressure from Brexit as bankers & others flee London to Europe. With the pound crashing to new lows since 1.3 €(EUR) / £(GBP) on 2016-06-23 more British in UK are realising Brexit was a mistake (holidays & imports up, (& UK won't be exporting cheap to EU if no trade deal)). British in EU don't want Brexit (& had their votes stolen by British parliament). British in UK don't realise the deep anger & disgust among British in Europe, over Britain's stealing their votes, + disregard for rights of Britons in EU, & + May's hard Brexit negotiation rolling disaster for British abroad: Problems of job/ residence permits etc that may expire as Britain exits EU, pension rights, health treatment etc. "Why trust the least democratic country in Europe, that stole 3.7 million votes from the Brexit Referendum? " May's hard Brexit negotiations are on course to fail, as monitored by British abroad, failure may force millions of EU British back to Britain, jobless, a financial burden on britain, & millions of Europeans out of UK, impacting UK skills, services & tax revenue base. Could the UK split ? Yes Quite Possibly, Probably not a question of If, but which bit first & when. Reject May's Lie: "We must abide by a democratic decision." Full democracy ceased when Parliament stole 3.7 million votes. Democracy failed when the British Parliament stole Referendum votes from 700,000+ British already in Europe, whom Brexit would hit hardest. PM Theresa May falsely asserted "democratic decision" in her UK article 50 letter to the EU. 3.7 million abroad could not vote, it was Not democratic. 3.7 million British abroad, at 68,000 electors per MP should have 51 MPs representing British abroad. British abroad have No MPs representing them. Britain is not democratic, just a partial rump democracy, & less democratic than any other country in EU except Eire (Only UK & Eire steal votes from citizens abroad, no other EU country does. While Britain steals the votes of its own British citizens, Britain gives votes to citizens of the independent state of Eire & Commonwealth countries who are resident in the UK. Hold a second referendum on EU membership. "Hold a referendum on the final Brexit deal"
"Parliament will consider this for a debate"
"Give all British citizens living abroad the right to vote and dedicated MPs"
"At 10,000 signatures, government will respond"
References within the Brexit page on this site.